If you have an indoor cat, you are going to need to provide them with a place to do their business. Obviously, cleaning out a littler box is no cat owner’s favorite task, but what if you didn’t have to go through all the effort of scooping on a daily basis? Well, now is the time to check out self-cleaning litter boxes. Of course, the range of options which you have available vary in design, features, and cost, which is why we have created this guide to simplify the entire process for you. After reading through the available information, you should feel much more able to make an informed decision. Designed like a regular toilet, this self-flushing cat box removes cat waste and washes itself clean. It can be used by as many as three cats of regular size, but bear in mind that you are going to need to hook it up to a cold-water supply and electrical output. Also included in the set are a recyclable SaniSolution cartridge and box of washable granules. Essentially, it takes away all the time, effort, and unpleasantness of changing your cat’s litter tray and reduces it all to the touch of a few buttons on the programmable pad. Promising to significantly reduce litter tracking, the locking lid acts as a walk-off mat. As for the design, it is modern and complements contemporary homes nicely. The swivel lid has been designed for easy waste removal. The scoop is also included and hangs off the side, so you don’t have to worry about losing it. The liners which fit inside are rip-resistant and designed to last for a period of three months. If you are looking for a simple design in a self-cleaning litter box, this one requires no electricity, liners or filters. The cleaning method is as straightforward as it rolling to the right and back again. Separating the litter from the waste is a patented grill. The cat waste collects in the pull-out tray for easy disposal. As for the assembly, it is designed to be straightforward to reduce frustration. The cat litter box’s bigger size makes it ideal for larger felines or households with multiple cats. This self-cleaning litter box has the advantage of going for weeks without the need for scooping, cleaning or refilling of any kind. The covered trap locks in the odor, helping to stop your house from smelling. Since the crystals included are low-tracking, you are much less likely to find cat litter all over your house. Another useful feature is the plastic tray lining which protects against leakage. When it is time to change the litter, you just need to remove the disposable litter tray, throw it away, and replace it with a new one. Nobody likes the effort of having to scoop out their cat’s litter box every day, and this self-cleaning litter box takes away the need to do so. Once your cat exits the box, the cleaning cycle begins 10 minutes later. Essentially, it works by the automatic rake moving forward and backward to push the lumps of waste into the waiting receptacle. The design is small and compact, which makes it best-suited to households with a single cat. Promising no scooping and no mess, this automatic litter box is easy to set up and clean. It continually sifts waste throughout the day on a slow cycle, but also boasts a low power consumption, so you don’t have to worry about it jacking up your energy bills. To make cleaning up after your cat easier, you can line the waste bins with recycled bags and just take them out when needed. If you just have one cat in your household, you will need to clean the litter box roughly every two weeks, which is significantly better than the daily scooping that you would otherwise have to do. 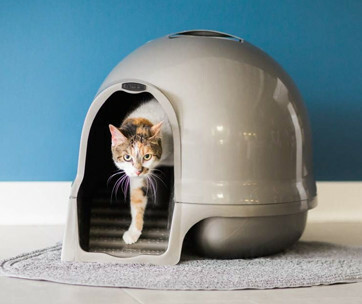 This self-cleaning litter box detects when your cat has been to the bathroom and automatically rakes away the waste into the receptacle. The walls are high enough to reduce the problem of litter getting scattered all over the place, and there is also a paw clean-up mat. Since the box comes in extra-large size, it is suitable for bigger felines or households with multiple pets. There is even a nightlight setting, so your cat can easily answer the call of nature in the middle of the night! 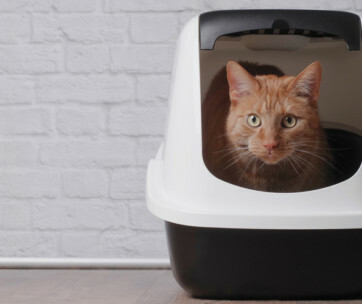 All technology seems to be getting smarter these days, and this litter box even connects up to Bluetooth and notifies you if there is a change in your cat’s behavior! Download the app and you can monitor maintenance, performance, and even your cat’s health. Designed to work with any cat clumping litter, this self cleaning cat litter box automatically scoops waste 15 minutes after your cat exits the box. Everything is poured into the enclosed waste bin, which features a carbon filter for increased odor control. This self cleaning litter tray is designed for usage by multiple cats over 15 lbs. Once your cat has been to the bathroom, the rake will automatically start cleaning the tray. You will be able to go as many as seven days with no scooping required at all. Once the waste has been automatically moved into the receptacles, the carbon filters will help to keep the mess and odor contained. The high walls help to stop litter scattering, while the paw cleaning ramp helps to prevent tracking. Designed for a quiet operation with less disruption for your cat and your household, this litter box will start its self-scooping action 15 minutes after your cat has left the box. Waste will automatically move down into the bin. Once it is full, all you need to do is remove the tray, take off the bag, dispose of it, and replace it with a new one. Six no-touch plastic bags are included along with this product, so you don’t have to worry about buying new ones for some time. While you should now know more about the various products on the market, you may want to know more about the different core features which can help you to make your mind up. So, here are a few of the main points to consider. First up, it is worth thinking about which type of litter box is going to be best for your cat and your household. 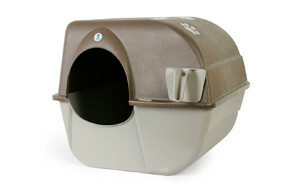 The standard variety is the open top litter boxes which come with no cover. There is usually a liner underneath which helps to prevent leaks. However, if you are looking for something ‘self-cleaning’, this is problematic as there is no way to stop odors from reaching your whole room. Covered litter boxes are similar but have a rough and an entrance and exit for your cat. Cleaning can be a bit tougher as you don’t have such easy access to the tray. Moving onto the more self-cleaning litter boxes, you have sifter litter boxes which act as a double crate with one acting as a sifter. Lift up one and the clumped litter and faeces can be easily removed. Finally, you have the true automatic cat litter boxes which do much of the cleaning and waste removal for you. At the upper end of the scale are those self-cleaning models which are connected to water. On the downside, the less work you have to do, the more expensive the litter tray tends to be. Cats come in all shapes and sizes, and so too do litter boxes. Small crates obviously work best for kittens, but you need to choose one with lower sides to ensure that they can climb in comfortably. Bear in mind that the inner length and width should comfortably contain your cat. As a rule of thumb, it should be one and a half times bigger than your feline, so get the measuring tape out. If you are unsure, you are better off choosing a size slightly too big than too small. Otherwise, your cat will feel uncomfortable using it. All cat litter boxes have different operating methods, so you should work out which is best for you, your household, and budget. The simplest and most affordable trays are likely to require more scooping and maintenance. As for the more complex ones, they may need connection to a cold-water supply and electricity, as well as coming in at a higher price point. Check out the description of each product, as well as reading some of the self cleaning litter box reviews to see if you can glean any more information from buyers. It is also worth finding out more about the installation process. It could only take a few minutes or it may end up being a much more complex task. As a rule of thumb, the more complex the design of the gadget, the less cleaning is likely to be required. At the upper end of the scale, the top-of-the-range devices require no maintenance at all. 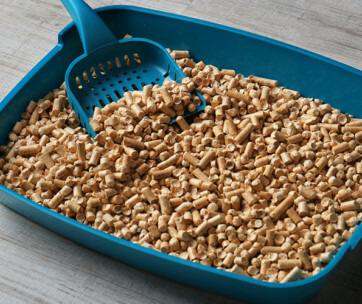 As you will have been able to tell from the above product guide, every self-cleaning litterbox has a different cleaning method, so you can decide which to choose based on your budget, household, and the amount of time on your hands. The convenience of a self-cleaning litter box comes from not having to deal with cat waste daily. Check out the size of the waste bin. If you go for one with a larger waste bin, this will contain more of your cat’s waste and will mean that you won’t have to change it so often. If you have a particularly nervous or anxious cat, a noisy litter box can end up being a problem as it could startle your furry friend. The noise factor is only going to be a problem for automatic self-cleaning litter boxes, so you may want to consider a manual model instead. As a rule of thumb, look for litter box makes a noise of 50 decibels or less. When it comes to choosing a gadget for your pet, it makes sense that you pay attention to what previous buyers have said. After all, they will be able to provide you with some information that you would otherwise not have had access to. However, you should also remember to take the ultra-positive and ultra-negative reviews with a pinch of salt. It is the ones in the middle which are worth paying attention to, as these are ones which are most likely to be genuine. Your budget is another central consideration in choosing the self-cleaning litter box for your cat. The manual ones tend to come at a lower price point, but they usually require more upkeep. You may feel like your budget doesn’t stretch to an automatic model, but this is much more of a worthwhile investment if you have a multi-cat household, as they can take a lot of the effort of cleaning and maintenance away from you. Consider how long the litter box is likely to last when you are making your decision. As a cat owner, you will already be well-aware of the unpleasant task of cleaning out your cat’s litter box. A self-cleaning litter box has several advantages over traditional models. Here are a few which could sway you into getting one for your cat. The most obvious advantage is that you won’t need to do as much work cleaning and maintaining your cat’s litter box. Most of the automatic kitty litter boxes work by detecting when your cat has gone to the bathroom and transferring the waste to a separate receptacle. Essentially, this means that you won’t have to keep scooping out the box on a daily basis. Of course, you will still need to empty the container and change the tray liners. At the upper end of the scale, you also have products such as the CatGenie, which washes away the waste and cleans itself. If you have two or more cats in your household, the job of cleaning and maintaining their litter boxes can feel like it is a never-ending task. Thankfully, several of the products which we have recommended above are designed for usage by multiple cats. They usually operate by detecting when your cat has been to the bathroom, and then automatically raking themselves. Rather than daily maintenance, you usually only need to clean them out every few days. If you find that your cat has been going to the bathroom outside of their litter box, the problem may be that the container is not clean enough for them. If there is too much of a waste build-up or the litter doesn’t smell fresh, your cat will be deterred from using their tray, and they may find the next available place instead. And wherever they choose, it is never going to make a pretty sight! A self-cleaning litter box maintains itself better, so you don’t have to worry so much about finding some nasty surprises around! The smell caused by your cat’s litter box is a major problem for many households. A self-cleaning box will clean up after your cat soon after they have been to the bathroom, and the waste will be automatically moved into a separate receptacle which is designed to reduce odors. Of course, you will still need to empty out the container on a regular basis, but your task becomes so much easier, and those unpleasant smells are much less likely to fill up your home. When it comes to choosing a self-cleaning cat box, you can select between an automatic or a manual model. Each one has their own set of pros and cons. Let’s start with the best automatic litter boxes. Generally, these are programmable, or they come with a motion or weight sensor to detect when your cat has used it. The waste will be moved to a separate area where it will be sealed off. Some require special litter, while others work with what you have already. On the plus side, electric litter boxes reduce the need to deal with litter on a daily basis and move the odorous waste into a separate compartment. You can also easily dispose of the waste. On the downside, they tend to have a high price point. Some cats may find the movement of the box scary and get put off from going to the bathroom in that spot. Also, some owners have complained about their self scooping cat box motor jamming. As for the manual variety, these are often designed to reduce litter tracking throughout your house and the container is more contained to reduce odors. They usually feature some sort of system to filter the waste from the rest of the litter. This could be as straightforward as tipping the box onto one side. Obviously, there are no motors, so there is less chance that something will go wrong, but there will be more maintenance involved. The price is likely to be lower, but the device won’t be as sophisticated as the automatic models. Ultimately, the choice is yours when it comes to working out the variety which is best for you and your cat. A: A self scooping litter box is designed to reduce cleaning of your cat’s waste and reduce the amount of work you have to do. The way it operates depends on which variety you choose. Automatic self-cleaning boxes are connected to electricity and rake the cat waste into a connected bin. They are either programmable, they detect movement, or they clean slowly all the time. As for the non-automated variety, they need to be sifted on a regular basis to separate the waste from the central box. Q: What type of litter should I pick for self-cleaning litter box? A: The type of litter which you choose for the box depends on the type that you have chosen. The non-automated boxes tend to use clumping litter, while the automated boxes usually require non-clumping or specialized crystals. If you are unsure, you should check the manufacturer’s guidelines for confirmation. You don’t want to risk damaging your device by using the wrong kind of litter. Q: Where should I place my automatic cat litter box in my home? A: The location where you put the litter box in your house is an important consideration as this can impact how comfortable they feel using it. Ideally, you should choose a place which is away from obstacles and clutter. If you can find a quiet area which has few distractions, this will help your cat to relax and do their business. You should place the tray away from your cat’s food and water sources. Eating and going to the bathroom are two activities which should be kept as separate as possible! Q: How do I teach my new kitten to use a self-cleaning litter box? A: It is no good investing a lot of money in a self-cleaning litter box if you don’t take the time to train your cat how to use it properly. Many kittens learn where to go to the bathroom from their mothers, so you need to start by working out what they know and what habits they are following. Some cats go to the bathroom after a meal, while others like to go after a nap. Try to establish if your cat is giving you any clues that they want to go to the bathroom like meowing. Once you know when it is time, you can direct your kitten towards the litter box or put it inside if they haven’t yet learned how to clamber into the crate. You may have to show your cat about the basics of digging and burying in the litter box, which is a task that requires patience and may end up taking a long time. Never yell at your cat as this is likely to scare them and set the whole process back even further. You may want to start off the training with a regular litter box, before moving onto the self-cleaning one. If you are going to do this, try keeping the type of litter the same to establish a sense of consistency. We have chosen this ingenious self-washing and flushing cat box as the best self-cleaning litter box currently on the market. 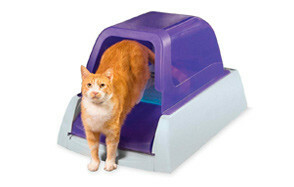 Up to three cats of average size can use this automatic litter box. Remember, you will have to hook it up to cold water and an electrical output for it to work properly. You can set the cleaning to the timetable that you want with the programmable pad. Since it is designed to work with washable granules rather than cat litter, you never have to worry about touching, smelling or buying it again. 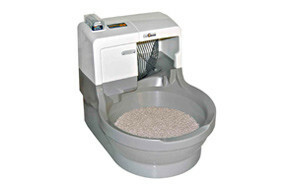 A highly sophisticated automatic cat litter box, it is the kind of product which revolutionizes this area of cat care.